Italian dinners at home don’t have to be limited to just spaghetti or lasagna. 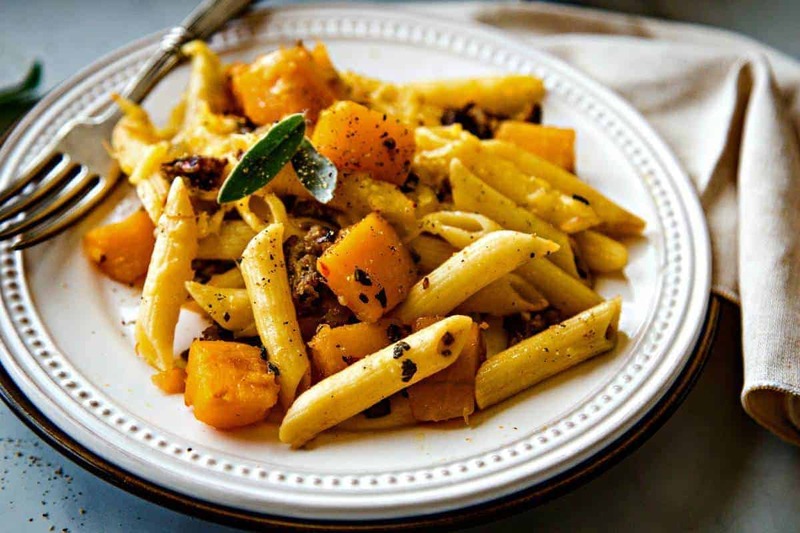 Why not try this Italian Sausage Butternut Squash Pasta Bake and mix it up a little? 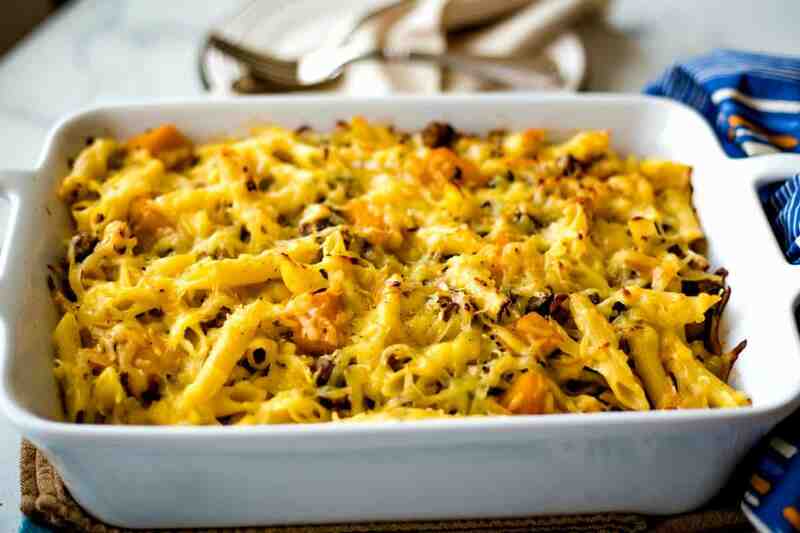 In this recipe, spicy Italian sausage and sweet, creamy butternut squash are combined with perfectly cooked al dente penne pasta and topped with smoked Gouda cheese for a delicious and comforting dinner casserole. Choose either sweet or spicy Italian sausage depending on your heat preference and add fresh sage and garlic to enhance the flavor in the sauce. Start to finish, this fresh and hearty dinner is ready in less than 45 minutes. 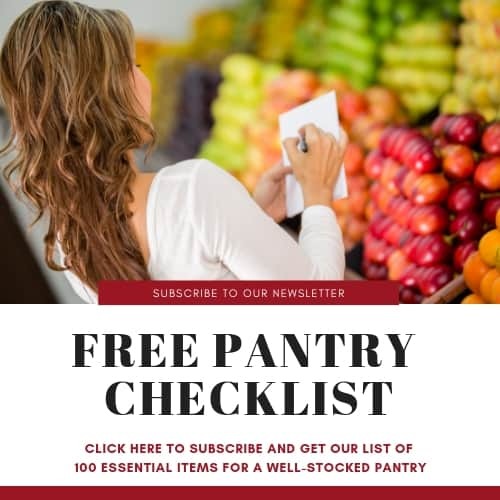 Sign up for our mailing list and get my Pantry Checklist of 100 essential items for a well-stocked pantry! We’ve just returned from a quick trip to St. Louis to visit our 8-week-old granddaughter and let me just say, no one ever told me being a grandmother would be so wonderful! I spent the entire time soaking in all the baby snuggles, sweet smiles, and little wiggles. What a precious gift to watch this little girl and to watch my daughter as a new mommy — it just warms my heart! A few years ago when our daughter, who never liked to cook, was in Seattle for grad school, she suddenly began cooking because it was a necessity. 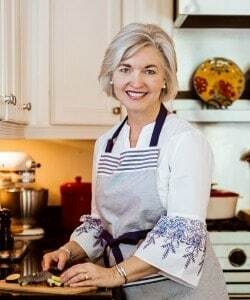 She became quite proud that she was learning to cook for herself and introduced our family to a butternut squash, sausage, and rice casserole on one of her visits home. 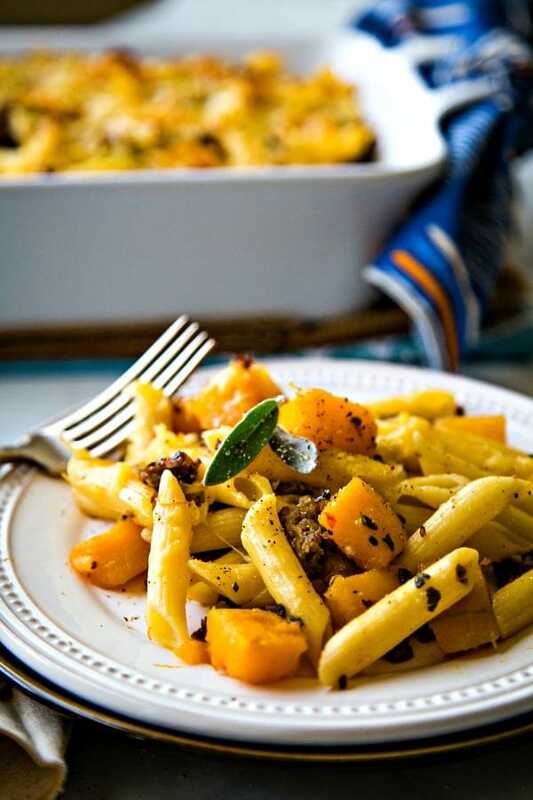 Last week, when I made today’s Italian Sausage Butternut SquashPasta Bake I had to smile thinking about how far she’s come in the kitchen and how she is now feeding her own little family. Wash and dry the squash with a paper towel. Use a fork to pierce the skin in several places. Place the squash on a microwave-safe plate and microwave on high for two minutes. Carefully handle the squash (it will be hot!) and wear kitchen gloves, if needed. Cut the ends off of the squash, then slice off the neck section. Lay the neck section flat on a cutting board and slice down the sides to peel. Next, slice this portion into 2-inch rounds and cut into 1-inch cubes. Peel the remaining section of the squash, then cut it in half vertically and remove the seeds using a spoon. Again, slice into 2-inch pieces and cube. 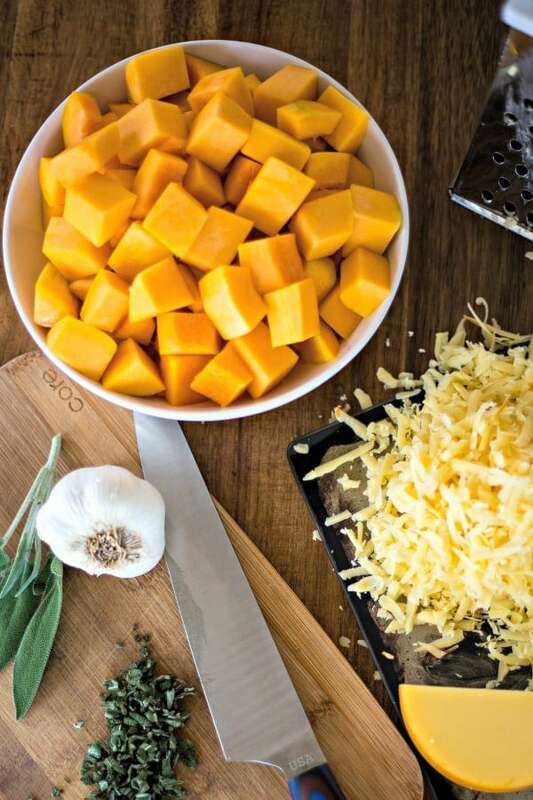 Once the butternut squash is peeled and cubed, the first step to making this dish is cooking the squash. Heat olive oil in a non stick pan and then add the cubed squash and cook, stirring occasionally, until it begins to caramelize around the edges. 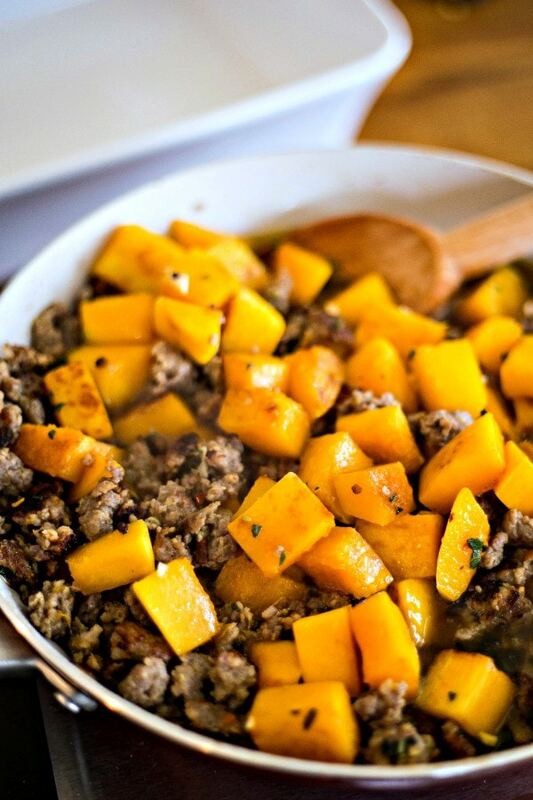 Remove the squash from the pan and set aside. Next, add the Italian sausage to the pan and cook until it is no longer pink and is nicely browned. Drain the grease from the sausage and return it to the pan with the chopped garlic, sage, and white wine and cook another five minutes. Return the butternut squash to the pan along with chicken stock and simmer until the squash is tender. Combine this mixture with cooked penne pasta and pour into a lightly greased casserole dish. The last step is adding cheese to the top. I suggest using a smoked cheese, either provolone or Gouda, for the best flavor and compliment to this dish. Pop the casserole into the oven and heat until the cheese is melted and bubbly. This pasta bake is best served immediately out of the oven. If you do need to reheat leftovers, add a little chicken stock before reheating. Butternut squash is one of my new favorite vegetables. Properly cooked, it has a wonderful texture and a slightly sweet flavor. I’ll admit that until recently I’d never attempted to cook butternut squash — mostly because it just seemed like a lot of trouble — but once I learned the easier way to peel a butternut squash (see my tips in this post), I lost all my butternut squash intimidation! 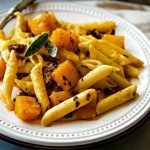 Today’s butternut squash recipe is pure comfort food and one that I think your family will enjoy! 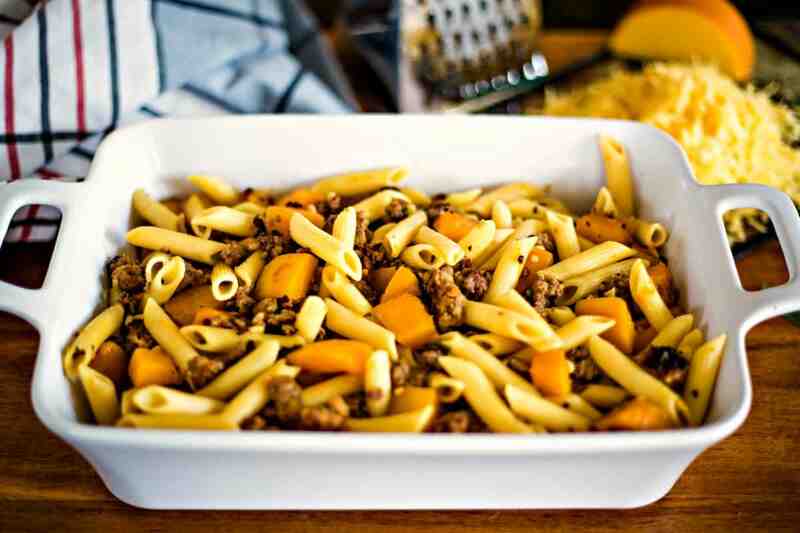 Did you make this Italian Sausage Butternut Squash Pasta Bake recipe? 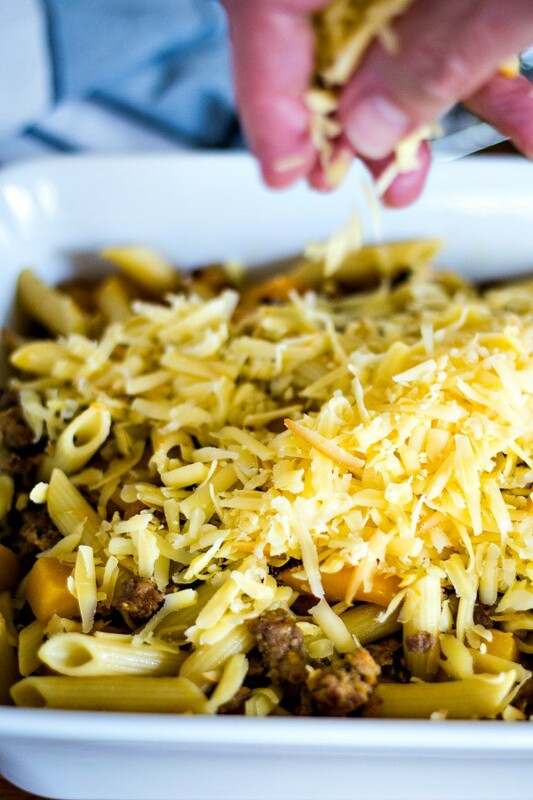 Spicy Italian sausage and sweet, creamy butternut squash is combined with perfectly cooked al dente penne pasta and topped with smoked Gouda cheese for a comforting dinner casserole. Heat olive oil In a heavy skillet over medium high heat. 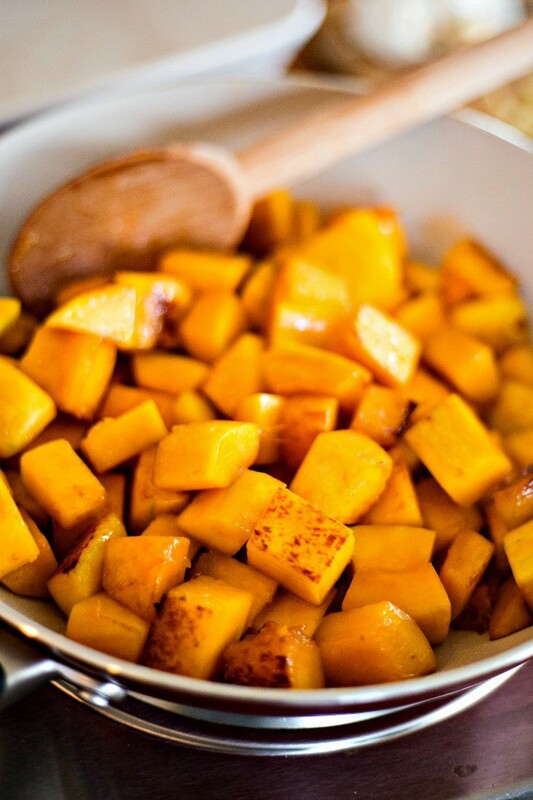 Add the butternut squash and cook for about five minutes or until the edges caramelize. Remove from pan and set aside. Add the Italian sausage to pan and cook and stir until browned, about five minutes. Drain the cooked sausage on a paper-towel lined plate and return to the skillet with garlic, chopped sage, and white wine. Simmer for three minutes or until liquid is evaporated. Add the chicken stock and butternut squash and cook on low heat for 10 more minutes, or until squash is tender. In the meantime, cook and drain pasta per package directions. Lightly coat a 9x13 casserole dish with cooking spray. Combine the pasta with the sausage mixture and pour into the dish. Top with shredded cheese and place under the broiler until the cheese is melted and bubbly. Serve immediately.